As health care moves into the home, safe patient handling techniques need to follow. More family members are playing an active role in the care for their aging parents and loved ones with physical disabilities. They do not have a lot of training and need easy to use equipment for lifting and transferring their loved ones to and from their bed and wheelchair. Musculoskeletal injuries to the back, neck, shoulder, and arms are common among caregivers. The only safe way to lift a patient is through the use of a mechanical lift, not through body mechanics. An overhead lift protects caregivers from injury while providing more efficient transfers and increased mobility for patients. There are risks involved in moving patients in the home when a device is not used. An overexerted caregiver could accidentally injure themselves. An overexerted caregiver could accidently harm the patient. The patient may be injured by being dropped, jarred, or not properly handled during unassisted transfers. Overhead Patient Lifts provide zero lift for caregivers, reducing debilitating back, shoulder, and arm injuries. 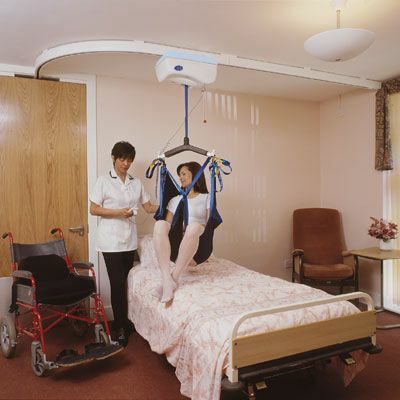 The Titan 500 is an overhead patient lift designed for home care. It is freestanding so it does not attach to the structure making it a portable solution for inside or outside of the home. It allows a single caregiver, often a family member, to safely transfer a patient from bed to chair and back again without the fear of injury. Safe and simple to use, the Titan 500 is virtually maintenance free. Proudly Made in the USA, the Titan 500 comes in three sizes and works with any size bed. The lift ships directly to the customer from our factory in Michigan. It arrives partially assembled and can be fully assembled by two adults in thirty minutes. Learn more about the Titan 500 on our website, find us on Facebook and watch our YouTube channel. Caregiving is a tough and thankless job. If you care for someone with limited mobility, you must be careful to protect yourself from injury lest you become a patient yourself. Musculoskeletal injuries to the back, neck, shoulder and arms are common among caregivers. In reality, caregivers suffer more injuries than construction workers. As a caregiver, it is up to you to protect yourself when helping a patient out of a bed or chair. The only safe way to lift a patient is through the use of a mechanical lift, not through body mechanics. The caregiver risks the health of both the patient and themselves if they try to perform a lift or transfer without an assistive device. Musculoskeletal injuries are a major reason why healthcare workers have the highest rates of injuries requiring time off. The estimated cost for healthcare workers annually is $7.4 billion in medical and other costs. Whether you care for patients in the home or the hospital, the risk of injury for each manual lift is 75%. Hospitals, nursing homes, and rehab facilities all use assistive devices, some version of the “patient lift”, to easily transfer patients. They use ceiling lifts as well as floor-based “Hoyer” lifts and sit-to-stand lifts. These are all important assistive devices that can efficiently transfer a patient while protecting the health care workers from injury. The home presents challenge that highly staffed and funded health care facilities do not have to worry about. More family members are playing an active role in the care of their aging parents and loved ones with chronic disease and physical disabilities. They do not have a lot of training and need easy to use equipment for lifting and transferring their loved ones. 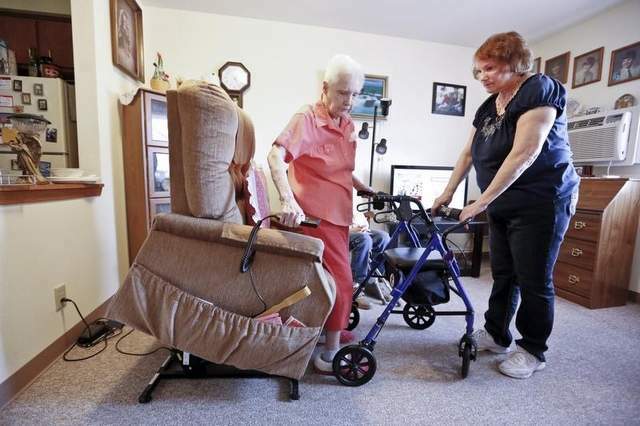 Home care patients and family caregivers may not be able to make permanent modifications to their home due to the lack of integrity of the structure or lack of ownership of the property. They may not want to make permanent modifications as it may be cost prohibitive or they plan to downsize or move in with another family member. These types of situations would prohibit the purchase and installation of a ceiling track system that can travel throughout the house. Family caregivers may have physical limitations that prohibit them from using a floor based patient lift. They may lack the physical strength needed to move a patient in a lift over carpeted floors and around bedroom furniture to place them in their wheelchair. 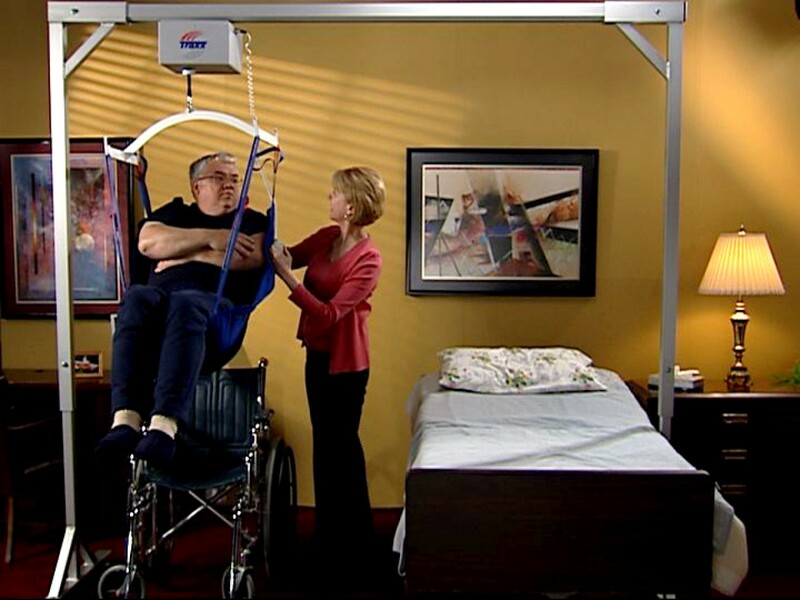 Caregivers now have the Titan 500, a Freestanding Overhead Patient Lift system designed for home care. It can provide the advantages of an overhead lift while avoiding the costly pricing and installations costs. It avoids the problems of the floor-based lifts while being competitively priced with an electric floor-based model. The Titan 500 consists of a freestanding frame with an overhead trolley beam that supports a rechargeable electric motor. 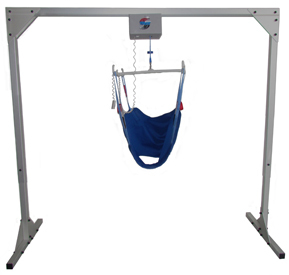 It is equipped with a four-point lift bar that spreads out the included lifting sling to provide a more comfortable transfer for the patient. The system comes complete with a remote control and battery charger as well as an included universal sling. The Titan provides a safe, comfortable and compassionate lift for a loved one or patient, providing dignity during a difficult time. For more information, visit our website, watch our YouTube channel and find us on Facebook.